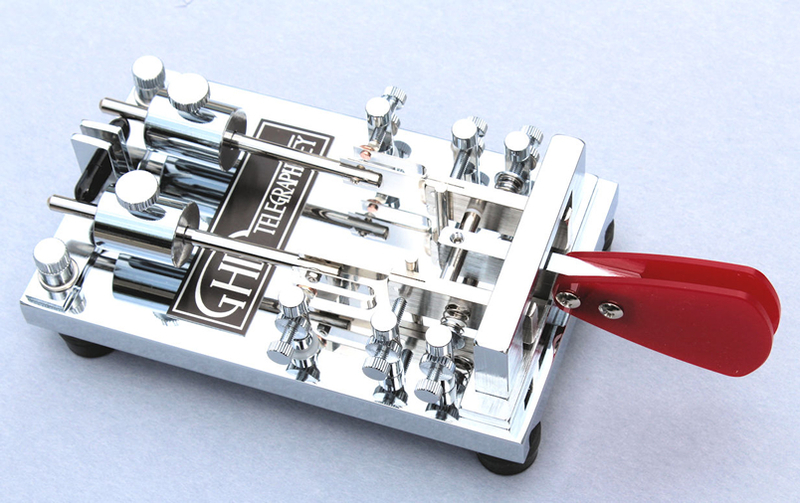 GHD keys, made by Toshihiko Ujiie (JA7GHD) in Sendai City, are beautiful, practical, and innovative. The "D" models use optical sensors in place of physical contacts (see below for more info). For a discussion of dual levers and optical sensors in bugs, see "Bugs: Want some Technology with That?" A note about the photography-- that much chrome is tough to photograph! What may appear to be smears or blotches in the photographs are often reflections, and sometimes diagonal lines result in a jagged or "aliased" appearance. 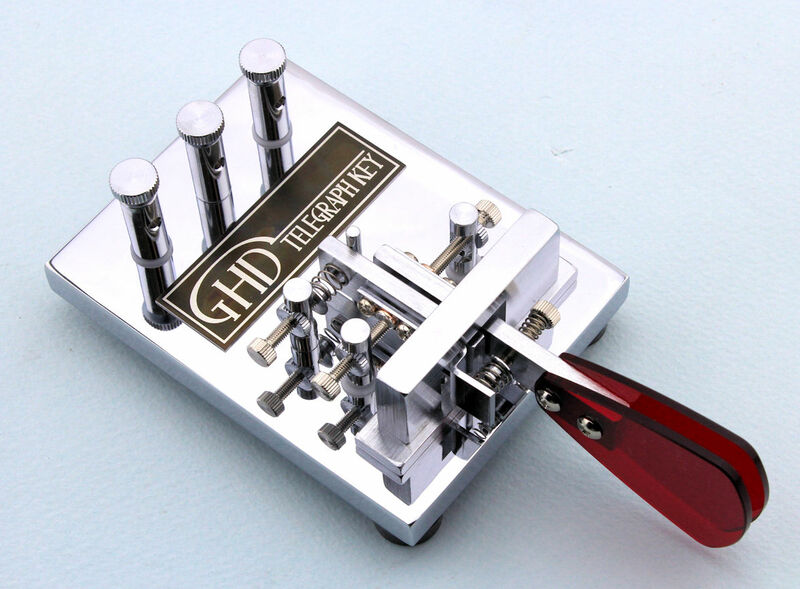 Please rest assured, the base of each GHD chrome key has a superb mirror-finish, at a time when OSHA and EPA restrictions have made good chrome plating almost impossible in the US. Larger upper parts have what GHD calls a "pear" finish which is a flawless satin chrome, much more resistant to fingermarks. The black-based keys are a heavy, durable multi-layer powder-coat which will resist wear and marking for many years. The black-based keys are more expensive than the chrome versions, because the powder-coating process and associated handling are more expensive than electroplating in Japan. 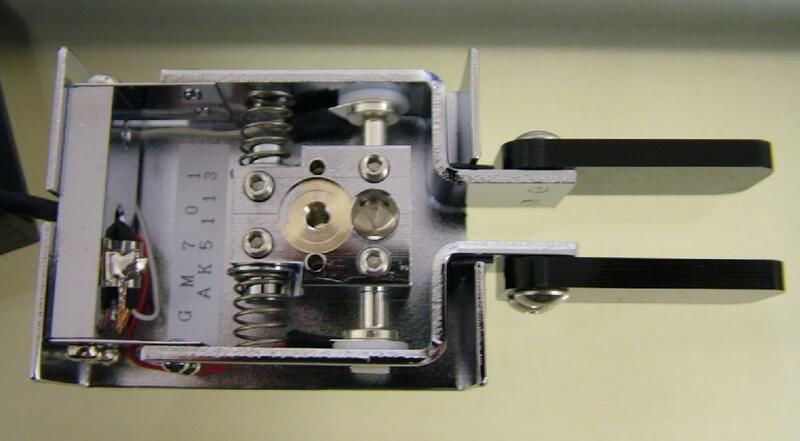 Referring to the top keys in GHD's line, we're often asked why anyone would want a micrometer for contact adjustment, or a machined ceramic contact insert, or aircraft quality ball bearings. Experienced operators are extremely particular about the adjustment of their keys. They demand precise adjustment that is easy to achieve, repeatable, and stable. The Mitutoyo micrometer makes it possible to adjust contact spacing to within a fraction of a millimeter, and if you have to open the contacts up for cleaning, or insertion of a bug wedge, you can dial right back to where you were with no trial and error. The machined ceramic insert evenly distributes the impact applied to the lower contact, without the obnoxious "clunking" sound of more traditional contact mounting methods. Aircraft quality ball bearings provide frictionless trunnion movement with zero side-play and since they are permanently lubricated, and will not wear, you can look forward to a lifetime of regular use without ever needing to adjust the bearings. 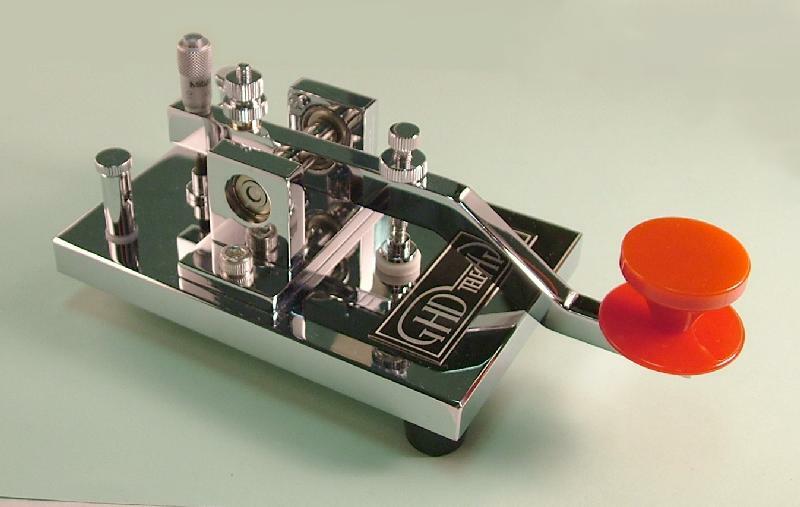 JA7GHD'S GHD operation was featured in the August 2006 issue of CQ Ham Radio. Click here to view a scan of the article (pdf, 150Kb) and here for a scan of GHD's brochure (April, 2019 pdf 1225Kb). 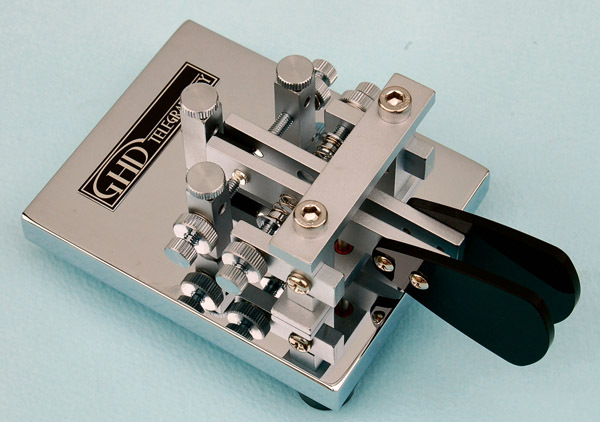 There is a wealth of information on the GHD web site, including several fascinating videos of GHD keys in use, and a brief demo of bug and cootie-key sending). action of this key is almost beyond belief! 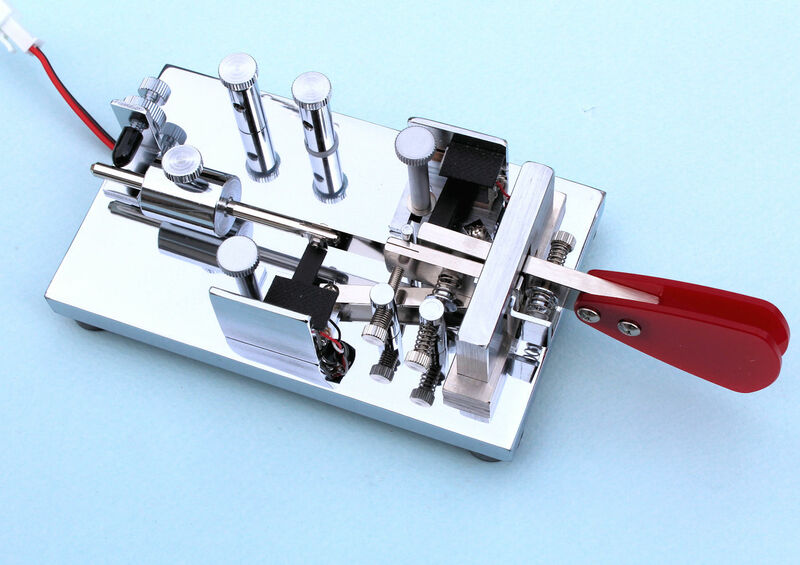 Model GT502MIL is the "American Style" version of the 502, with bent lever. 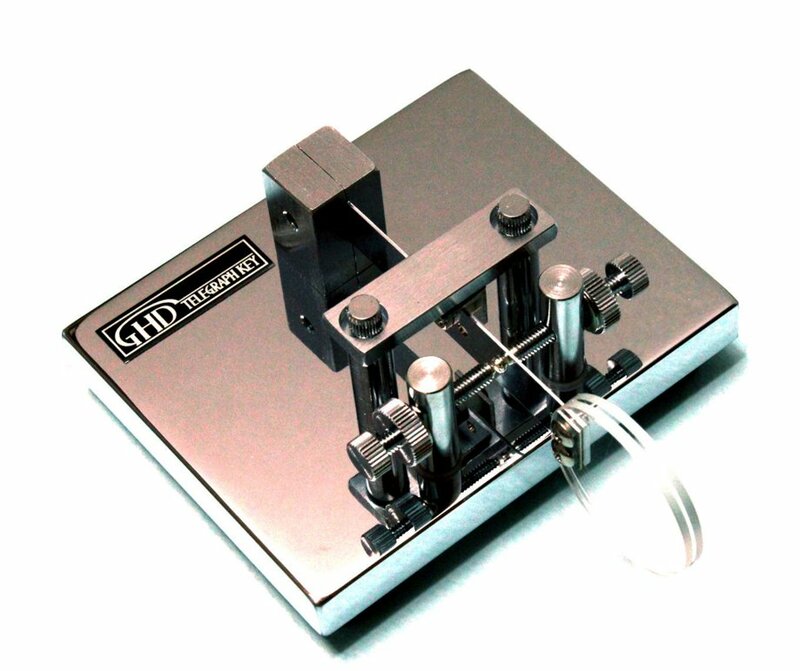 The base measures 5x3-1/4"
GHD's "intermediate key" is a solid performer, with machined ceramic contact insert, hard silver contacts, "oil bearing" and long lever. 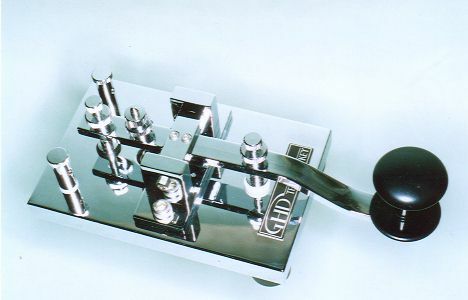 GHD's "standard key" as above, with "bent lever" perfectly suited to the American sending style. 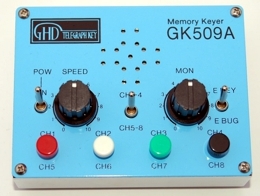 GT504A was changed to GT504MIL and the key has a red two-part knob like the GT501/502MIL keys. 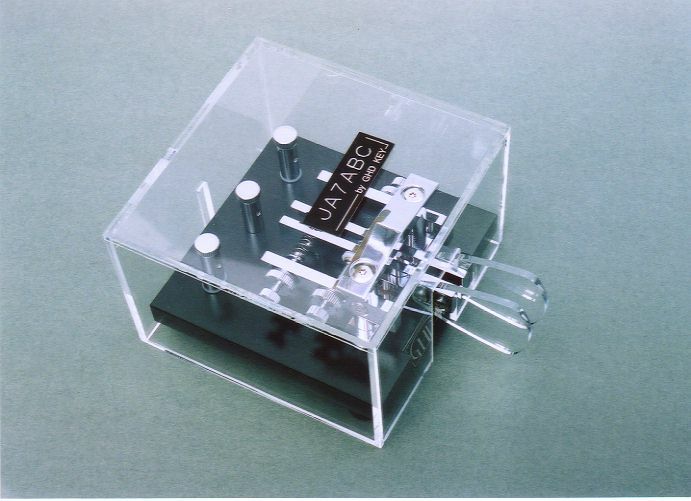 The base is 5 x 3-14"
Mechanical Contacts, Dual Paddle, Chrome -- "DX version" of GN607A with position of contacts and springs reversed. GHD quality at an entry-level price. The GN807F dual paddle has a hard-chrome plated base with satin chrome parts, and silver contacts. package with fully retractable levers. The attached cable has stripped/tinned ends for easy installation of a plug or direct connection to your equipment. It;'s here! The world's first user-reversable bug! 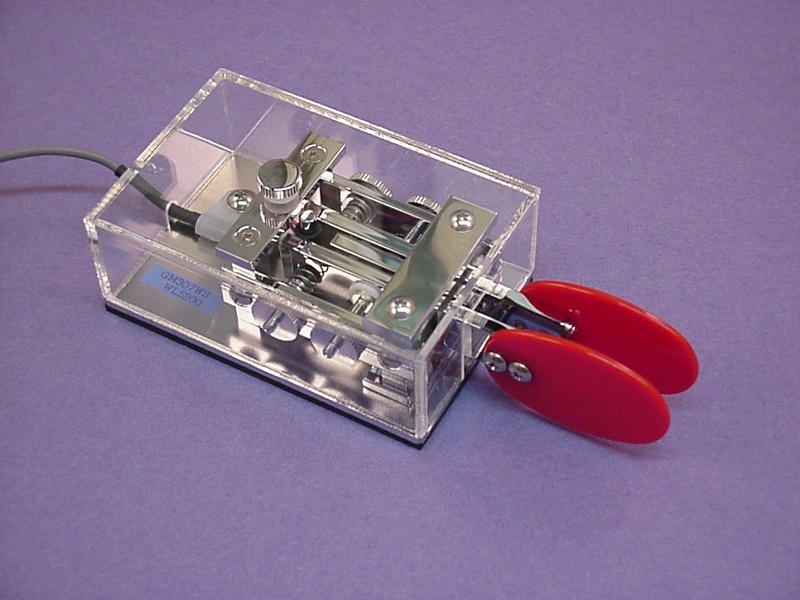 The classic semi-automatic "bug" key with mechanical contacts and double fingerpieces for a wider grip. 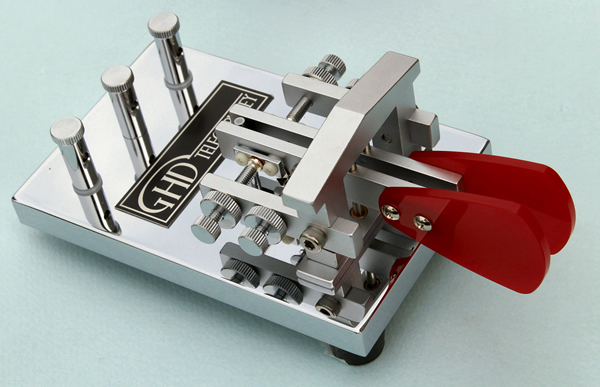 The devil is in the details, and GHD's choice of materials, dimensions, and other technical features, results in a bug that has an unusually crisp and precise feel over its entire speed range. N1FN says it feels a bit like the Speed-X 501. Fingerpieces and weight are packed separately, but easy to install. Dot speed adjustment over the entire range (about 18-32WPM) is a breeze with minimal dot dwell adjustment required. 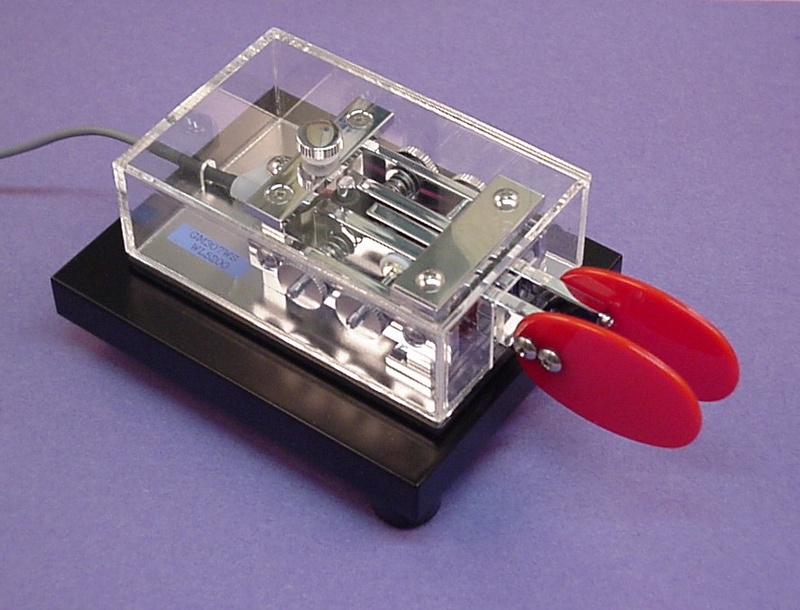 The classic fully-automatic "bug" key with mechanical contacts is the first "autokey" GHD has made in a decade. The devil is in the details, and GHD's choice of materials, dimensions, and other technical features, results in a bug that has an unusually crisp and precise feel over its entire speed range. Fingerpieces and weights are packed separately, but easy to install, and there is a third weight that can be installed on the dash lever to bring the speed down farther. The GN209W weighs 2-1/4 Lbs and the base measures a tidy 3" by 5". Click on the picture to view in full size. 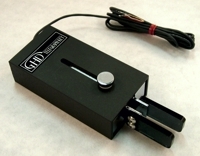 The GHD SUPERAutobug Keyer is a state-of-the-art electronice memory keyer with some unique features. All controls are on the front of the enclosure-- no "programming" is required. Flip the switch on the right and your electronic keyer becomes an "E-bug," or electronic semiautomatic bug key. 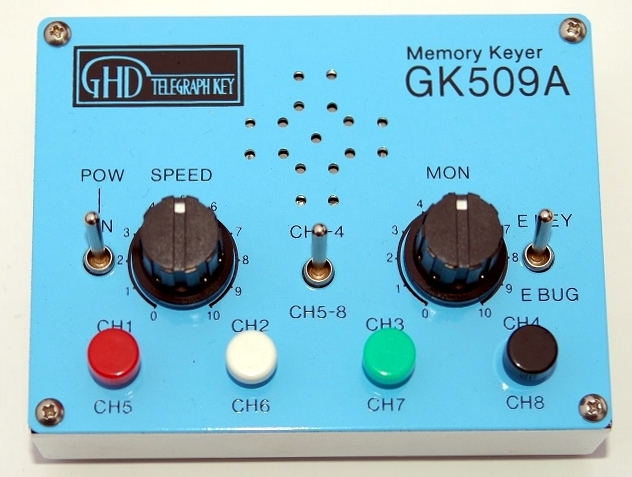 Many modern keyers can be operated in bug mode, but this one will record your messages with whatever "bug spacing" or rhythm you use. You can even record message memories with a straight key, and all of the details of your "fist" are preserved for instant sending. 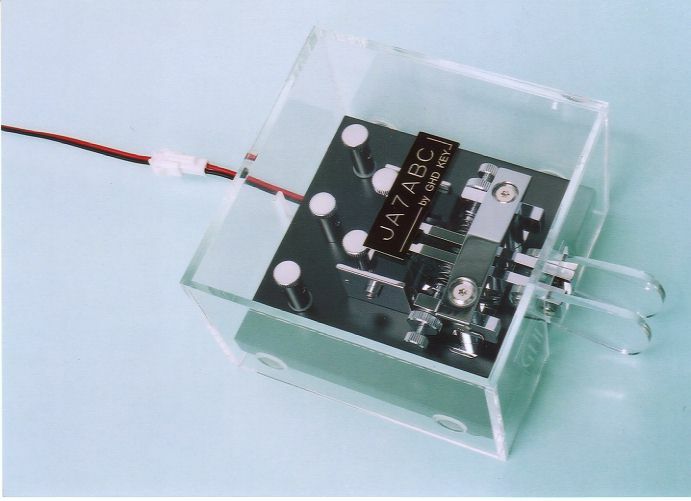 There are standard 1/8" phone jacks on the back for connecting your paddle, bug, or key to the keyer, and your keyer to the transmitter. Cables are included. The enclosure is metal, so the keyer is fully shielded. Current consumption is very low, and the internal batteries should provide over a year of use, even if you forget to turn the keyer off once in a while. 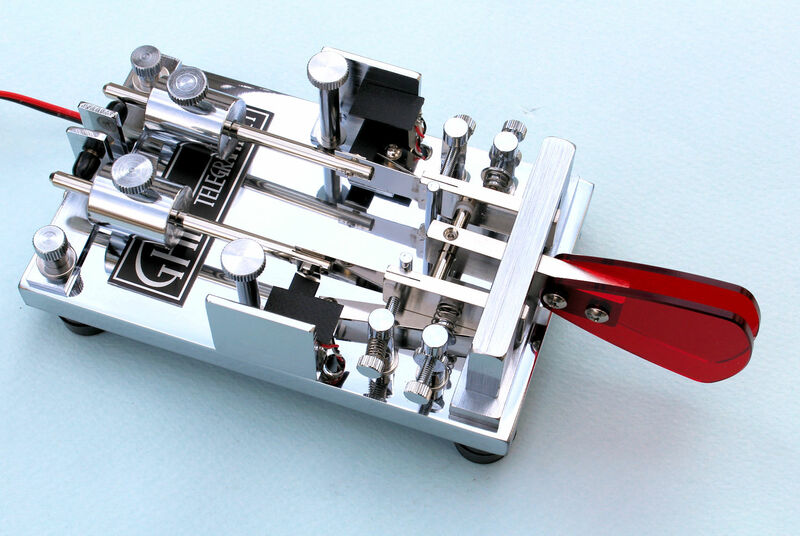 The GK509A measures 3-1/4 x 2-1/2 inches and weighs 7.9 ounces. Memory Capacity -- approximately 6000 characters. View the complete operation manual here! 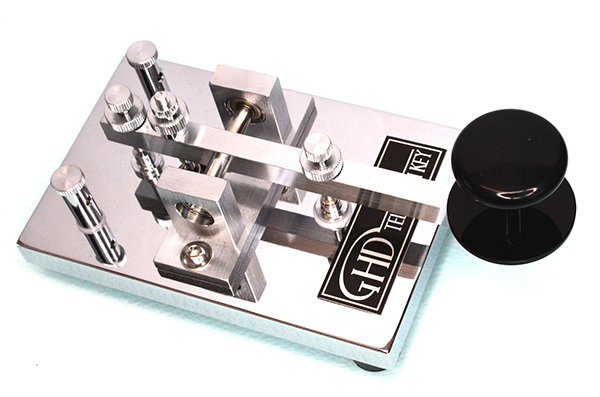 GHD's "Morse Training Unit" goes so far beyond the traditional Code Practice Oscillator that it really needs to be called something else! As a CPO it is superb-- the electronics are built into a tidy package featuring volume control, and enough clean audio to fill a classroom. But the MTU is so much more than a code practice oscillator! 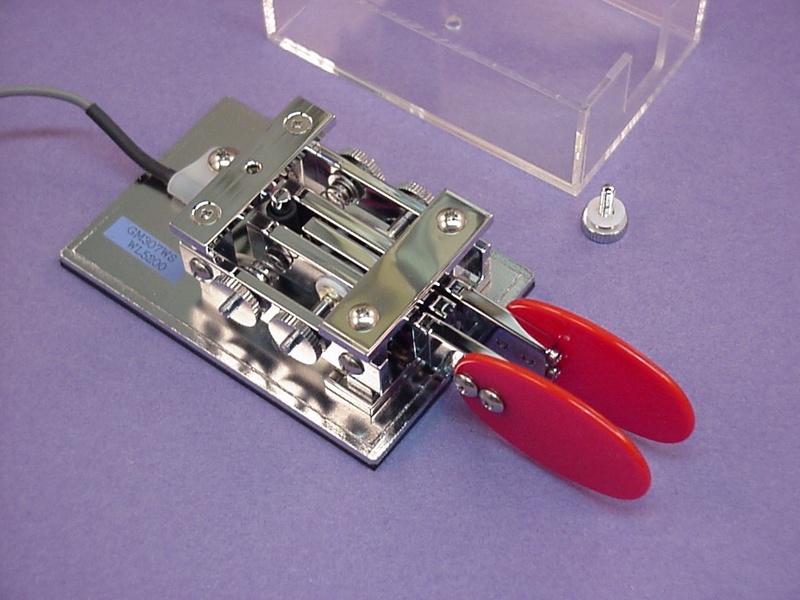 It has an electronic iambic keyer (similar to to GK509) built in, so you can connect a single or dual paddle and practice Iambic or traditional keying without needing a separate keyer. The keyer has 600 characters of message memory, so while you are practicing your paddle work you can record the output for later playback and verification. 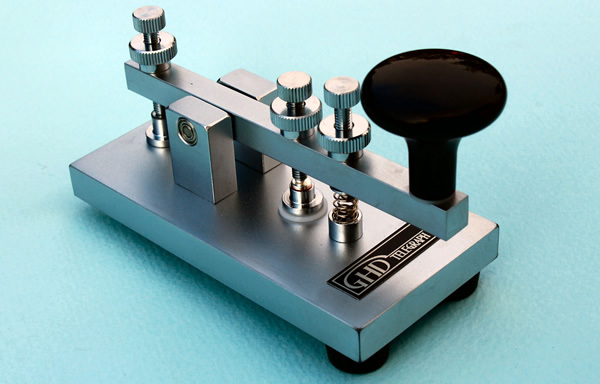 Great for checking the quality of your sending, and incredibily useful if you are doing a demonstration or teaching a Morse class. The speed range of the keyer is approximately 7 to 50WPM. But wait, there's more-- the keyer supports GHD's famous "E-bug" mode, in which a paddle can be used just like a semi-automatic "bug" key. It will even record your text in a somewhat unusual way. Each press of the dash lever will result in the recording of a pefectly formed dash in the message memory. If you mess up the timing of dashes you will hear the result when you play it back. Or to put it a more encouraging way, if it plays back good code then you know you have figured out how to send well with a bug. The new "/er" model of the keyer even includes an earphone jack for private practice. The GHD Morse Training Unit is powered by two AAA batteries ( included). Dimensions are 3-3/4 x 2-1/2 x 7/8" and the unit weighs 5 Oz. Click to view the GR301A/er documentation. 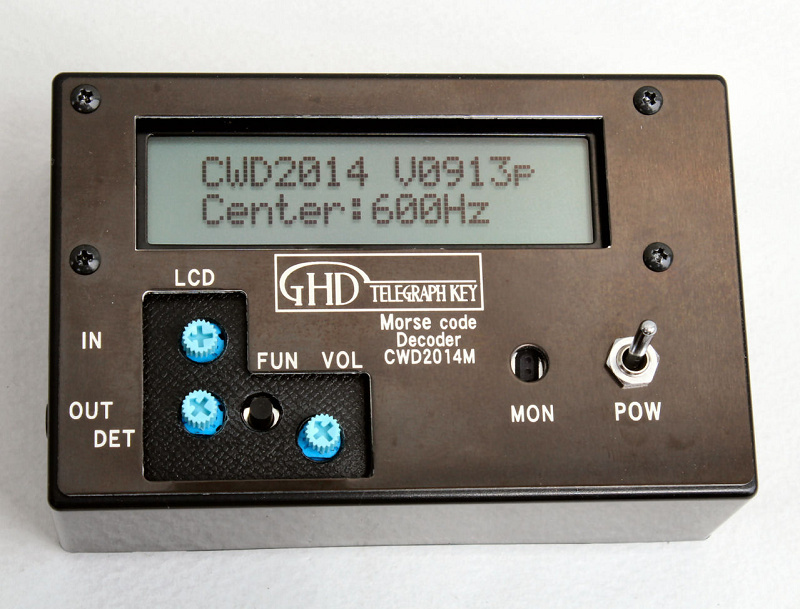 Operator confidence is built when CWD2014M can read keyer and straight key signals. Click to view the CWD2014M documentation. 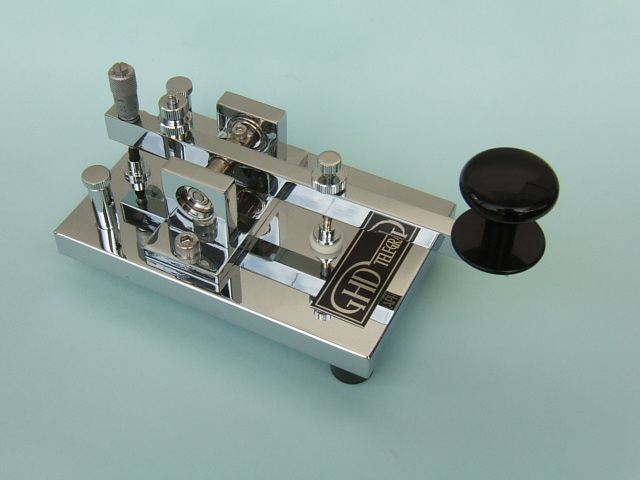 Additional photos of the GHD GM307WSR miniature paddle. These are large, high-resolution images so they may take a while to load! GM307WS With cover off Closeup of Mechanism On GOP1003 "Home Base"
The "D" models use an optical sensor arrangement which eliminates the need for physical contacts and results in extremely smooth operation. The sensor requires an external power supply of +10 to 15VDC, connected via a pre-attached pigtail lead with socket. Matching plug and a power cord are supplied. The images show the base of the GD105MKII bug, and a closeup of the sensor arrangement. 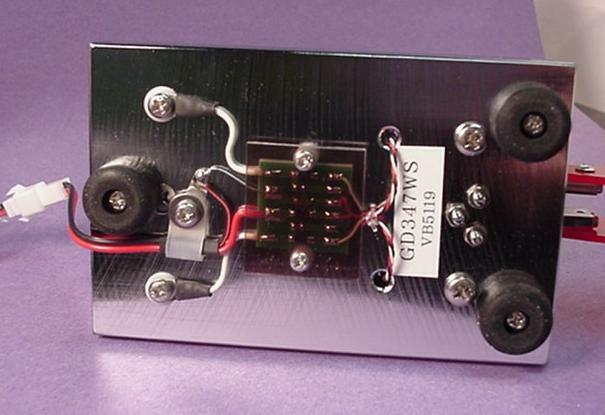 To view an image of the circuit diagram, click here. One might think the sensors themselves should be relatively inexpensive, but in the bug or paddle application the sensors have to be extremely fast. In fact, the cost of the sensors themselves accounts for 80% of the price difference between the optical and mechanical models, with the balance being the electronics to support them. The WS series is a unique design, applied to several paddle and bug models. It uses three levers, with six bearings, and can be configured easily for dual or single lever operation (dual is standard). 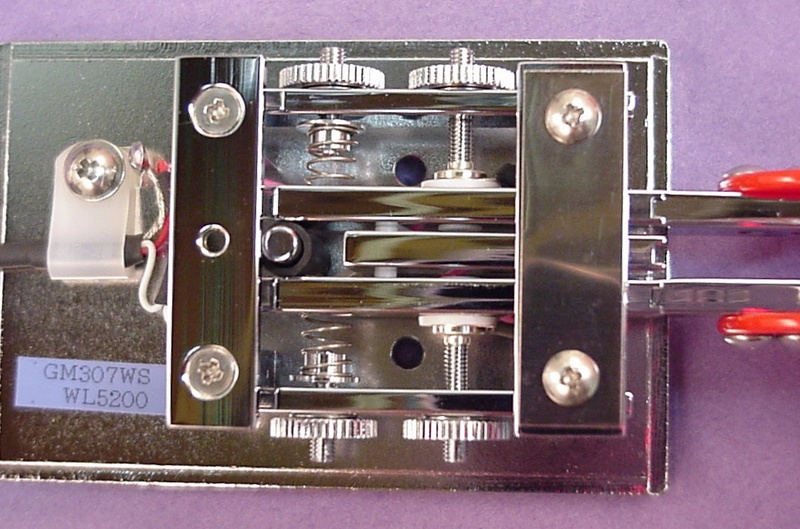 The ends of the levers, carrying the fingerpieces, are detachable from the levers. 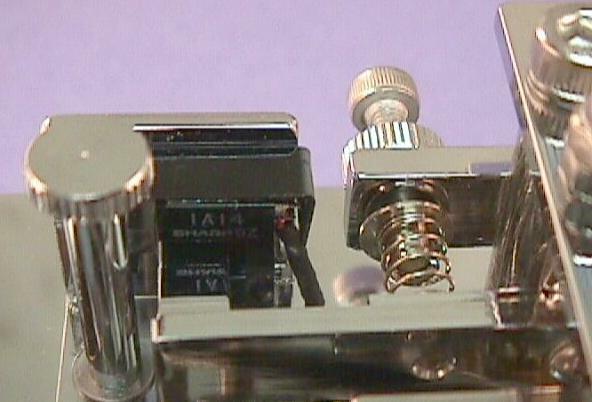 To convert from dual to single lever opereation, you simply remove the ends of the two outer levers and re-attach one of them to the middle lever. 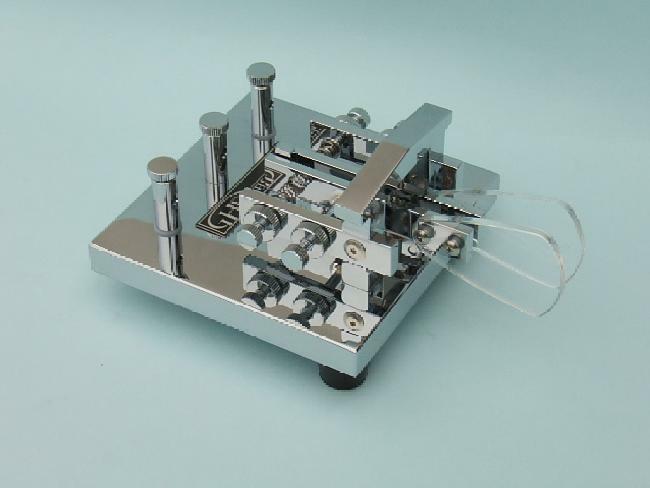 The plastic fingerpieces can be attached to either side of the levers, so in dual lever operation there are four possible fingerpiece spacings, and in single lever operation there are two (one or both fingerpieces can be used). What Others are Saying... 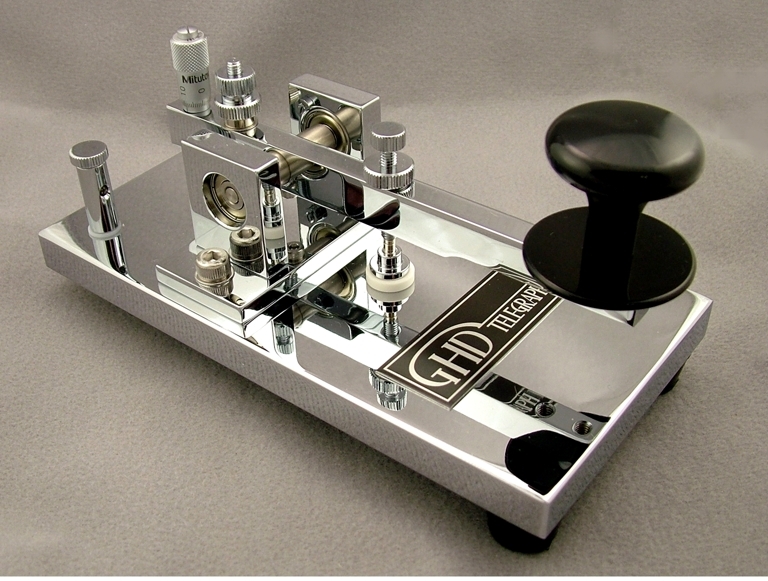 If you are a user of GHD instruments, your comments could be here! Write to us via the link below, and please be sure to say specifically that we can use your comments on the web page. could be that much difference! order at my estate sale someday! is a veritable happines. This is a splendid technology. 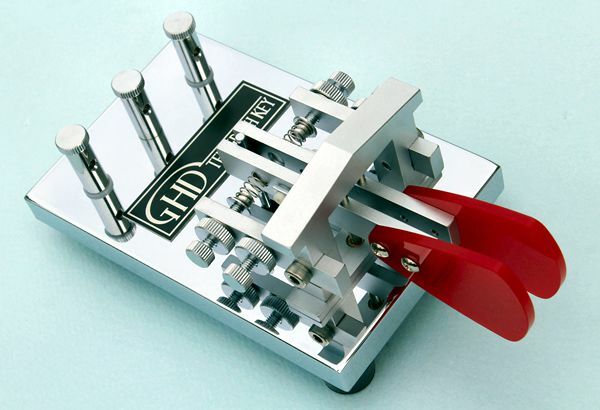 I just received the GHD GT706kit key. UNBELIEVABLE! anything I've experienced in my 35 years of brass-pounding. 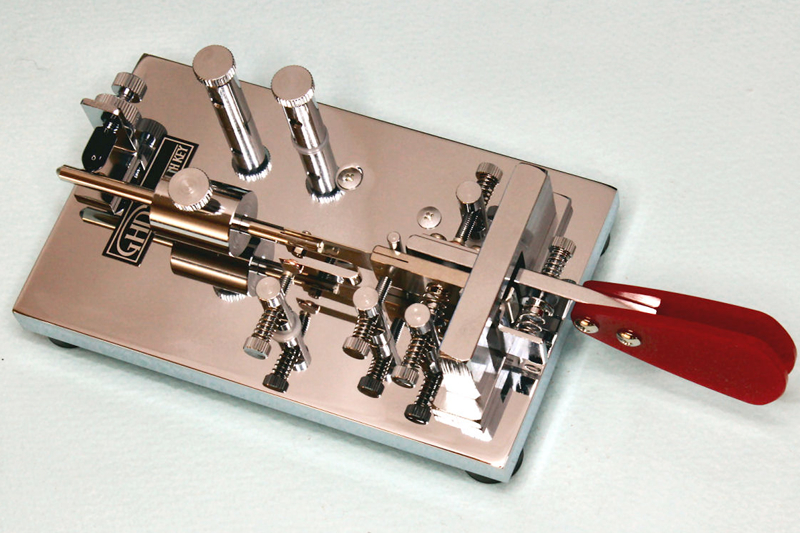 precision tooled keyer in a tiny metal case. Perfect! gaps/tension and sits firmly on the operating desk with no problem. which is ten years after my next license renewal. Order received today, thanks for the great service. none, a true work of art! Thanks again & 73, Phil, VK6GX. code to see where my money went. This is not just a shiny straight key. control. I don't think I could find a better key anywhere! micrometer setting fixity. I guess the small allen screw adjustment was revised. sound when "pounding the brass." when a lot of hand force is used. know, is that I will be doing a lot more straight keying from now on. Just to confirm receipt of the key, all in perfect condition. Your service is excellent and I am much obliged. so much fun to use that I'm re-arranging the shack to feature the new toy. to be able to meet the DHL man. WOW! Am I ever glad I waited. so that I don't have to put my fingerprints on that fantastic chrome job. 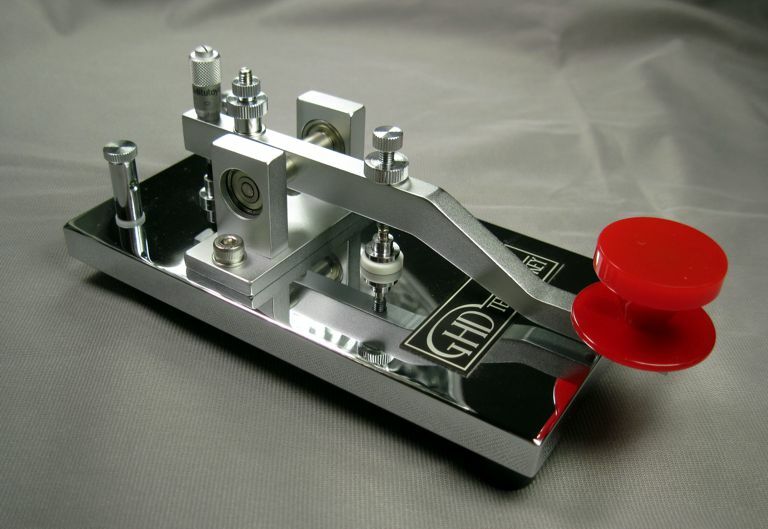 many of the better known manufacturers and the GHD keys surpass them all. hand. Thanks for all the advice and for your excellent service. reader to insure that I'm not too sloppy. on your web site simply does not do it justice (no picture ever could). the best straight key now in my collection. [GHD GT501M] I am not easily impressed. 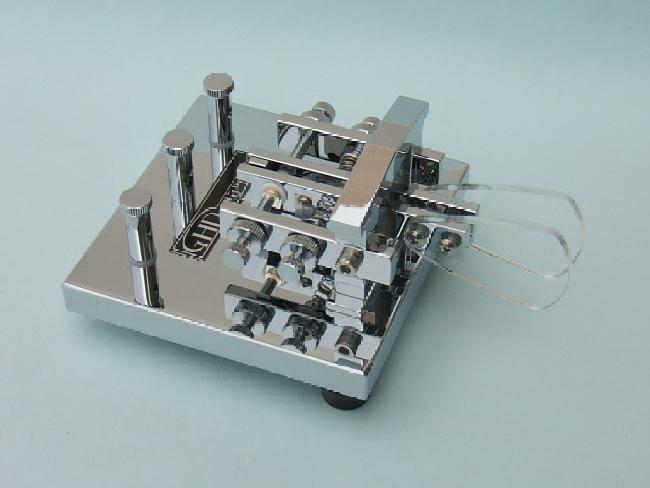 However, the build quality of this masterfully crafted key became immediately apparent upon initial inspection (one glance at its gleaming chrome finish and its phenomenal structural design will surely capture *any* CW operator's attention!) -- and... I can state, unequivocally, that I was impressed beyond belief! No other straight key comes close. believe it!!! It is not inexpensive, but honestly, it is amazing. [Vibrokeyer deluxe - single] and a pair of straight keys [limited to SKN]. high quality, beautiful and very usable key. put it away...the velvet touch is addicting! make what I considered to be perfect dots. My old one was also noisy. rate. To say that I am ecstatic with this new key is an understatement.